Did you start a spanking new speech therapy or education blog this summer? If so, congrats! Maybe you are still considering diving in. Like any new venture, you have lots of questions, and plenty to learn. Or perhaps you've been blogging a while, and want to up your game. My summer vacation is ending in the next few days, and I have been trying to put some "polish" on my blog before I get back to school to be ready for lots of great content from my therapy room! 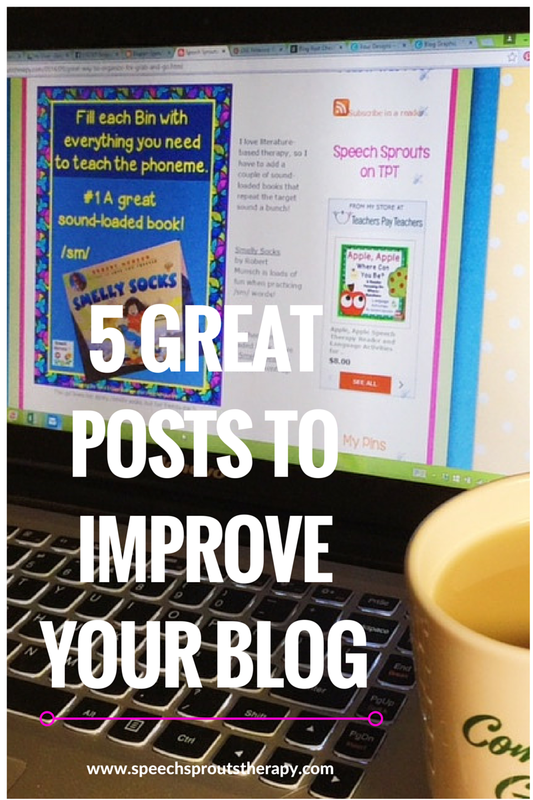 I have been looking for some smart tips to make Speech Sprouts blog a great place to visit. I want to find ways to reach more speech language pathologists, special educators and teachers. Why? 'Cause I have a lot to say! Here a few really helpful posts I would like to share. Melyssa makes the point that writing this page is kind of like an interview. What's special about you, and why should the reader invest their time in you? She offers a freebie worksheet to help you get started. 2. 10 Content Creation Tools for Bloggers by PINKPOT. Text editors, where to find fonts, tools to help make awesome graphics, this is a great list. If you want to get your posts pinned and shared, you need at least one beautiful image. We all respond to great visuals! Here are some inexpensive ideas. 4. How to Enable Rich Pins for your Website by Allyssa Barnes Web design. Have you enabled rich pins? What is that? read this post for an explanation and how-to. Suffice it to say you definitely want to do this. What's an "Alt" tag, and what do you do with it? Have you started an e-mail list? Kyla talks about ways to get your posts noticed. If you know of any other awesome posts to improve your blog, I would love for you to share them in the comments. And if you make any changes based on these tips, please share them with a link to your blog! We would love to take a peek. Thank you, thank you, thank you. I am always trying to improve my blog and these are wonderful resources. Thank you so much for sharing!